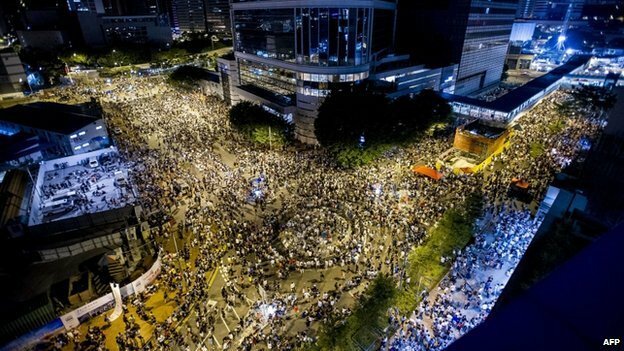 Tens of thousands of protesters have blocked the streets of Hong Kong, shutting down businesses and ignoring appeals to leave. Riot police withdrew on September 29 after overnight clashes in which they used batons and fired volleys of tear gas to try to disperse the crowds. China has warned other countries not to support the “illegal rallies”. Its foreign ministry said it opposed any interference in China’s internal affairs. Protesters – a mix of students and supporters of the Occupy Central pro-democracy movement – are angry at Beijing’s plans to vet candidates for Hong Kong’s 2017 leadership elections. They want a free choice of candidates when they cast their ballots for the chief executive – something Beijing says is out of the question. On September 28, dozens of protesters have been arrested on Hong Kong’s streets as tens of thousands of protesters faced riot police in the heart of the city. In a news conference on September 29, Cheung Tak-keung, assistant commissioner of police for operations, said police had used the “bare minimum force”. Cheung Tak-keung said 41 people had been injured in the past three days, including 12 police officers. The Hong Kong government urged protesters to stay calm and leave peacefully but crowds remained camped out around the government complex. Schools in the Wan Chai, Central and Western districts were closed on September 29 and will remain shut on the next day, according to the Hong Kong Education Bureau. China, which stations a garrison of the People’s Liberation Army (PLA) in Hong Kong, said it was confident the city’s administration could handle the protests. Tensions escalated on September 28 when the broader Occupy Central protest movement threw its weight behind student-led protests, bringing forward a mass civil disobedience campaign due to start on October 1.